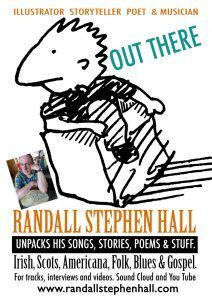 World Poetry Celebrates Randall Stephen Hall ! He is also available for shows, tours and events. “I grew up in North Belfast at the height of the Troubles. Born 1957. I grew up beyond many people’s context there and neither of my parents were from Belfast. These two experiences collided and reverberated with more for all my years since then, shaping much of my art and outlook. I left college in 1980 and got a job in a small add agency. That winter John Lennon was shot. I remember the news on the radio. 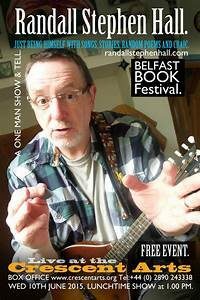 It seemed to link with shift, change and conflict in northern Ireland. Ann and I got married in 1983. We had two girls in 1985 and 1987. We now have two grandchildren of six and two. Both girls. In 1996 I self published a book called THE GIANT’S CAUSEWAY. https://www.youtube.com/watch?v=RnN5HQe1Fvk The advertising work began to diminish and I began to receive invites to visit schools to tell this story. A steep learning curve ensued from then until now. (I’ll keep this brief). During this time I began to create new stories, illustrated for projection and began to shape way of doing story telling that involved, hand drum, voice, interactive singing, song, poetry and a main story, lasting about an hour. All this has evolved slowly in a very natural way over a period of about 20 years. called Gerry Anderson (now sadly passed) found some of my funnier songs interesting and began to play them on the radio. So, in a period of about 9 months I created my first CD of poems and songs, using local themes, of identity, peace, conflict etc but doing it in an accessible way, with the addition of humour. This entry was posted in Ariadne's Notes, E-Poets, Featured musicians and artists., Featured Poets, General and tagged Author Sharon Rowe, International Peace Award Ariadne Sawyer, Randall Stephen Hall, Victor Schwartzman on February 5, 2019 by Ariadne.